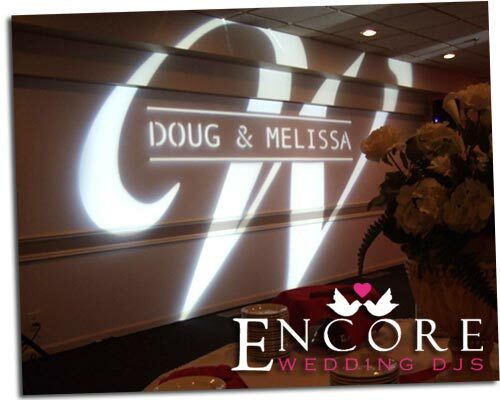 Last weekend we celebrated with Melissa and Doug for their wedding reception @ Club Monte Carlo in Shelby Township Michigan. They have a nice facility and the family did a great job with the decorations. Besides chair covers and the other traditional wedding decor, our client went with a custom name monogram for their wedding. It looked really cool projected onto the wall behind the dance floor. Basically what we do is design your monogram in wispy distinguished fonts. Name monograms also give nice backdrops behind the head table. This was a smaller wedding reception with about 85 guests in attendance. What I have noticed from experience, is that it is the smaller receptions that always turn out the best. The reason for this is that guests already know each other so there is no need to break the ice. You can also view Doug & Melissa’s survey at the link. Thanks again for inviting us to your special day.